Here at Korean Gender Café we have written about Man of Korea here, here and here. Today I am troubled to hear that the group’s leader, Sung Jae-gi, issued a fundraising statement tied to a threat to commit suicide if he did not raise all of the funds to support his failing organization. We sincerely hope he is healthy and safe, but recent reports indicate that the search is still on. Why did the leader of Man of Korea go to such lengths to fundraise? In the donation appeal below, Man of Korea claims that since the 1980s all of the laws, policies and institutions have accomplished gender equality. The appeal for funding argues that women are no longer socially weak in light of various changes (such as female president, ROTC, college entrance rates, and that they claim that the women’s employment rate is ahead of men’s, etc.). The appeal argues that we only discuss women’s stories in society. It asks for donations to support Man of Korea. There are two tragedies here. First, that Sung Jae-gi is missing or may be injured. If he is well and safe, he has no doubt caused a great deal of concern to those that care for him and mobilized the police and other facilities to the search. I worry for his safety and hope that this dangerous fundraising ploy doesn’t cost him his life or health. The second tragedy is that a fundamental unwillingness to cooperate and engage in honest dialog that has fueled major misconceptions between Man of Korea and other groups, such as the Ministry of Gender and Family. Fervor is whipped up and ideological passions flare and lead to extreme measures such as this dangerous fundraiser. We hope that his fans and Man of Korea members will not follow this suicidal example and instead can engage in serious conversations to address problems in society. I hope no one ever threatens their life for a fundraiser. 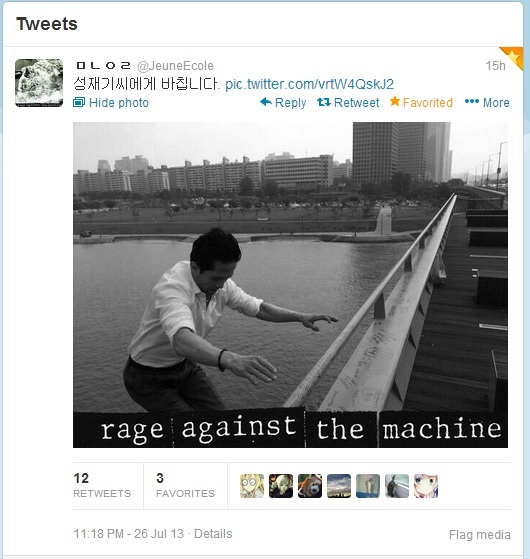 In doing so, what machine is Man of Korea raging against? July 31, 2013 Update: Man of Korea / Men's Alliance leader Sung Jae-gi has been recovered from the Han River, after a publicity stunt gone tragically wrong. His funeral will be held August 1 in Daegu.